You already know how to adapt recipes for a slow cooker. But how can you get more use out of the appliance of the moment: the instant pot? What’s an instant pot? We’re glad you asked. It’s an electric appliance that functions the same way as a stovetop pressure cooker, sans stovetop. Instant pots cook food by using heat in an enclosed environment: the pressure builds up around the food and breaks it down as a high-heat oven might. It’s particularly good for cooking starchy vegetables and proteins quickly. As a bonus, an instant pot can be used as a slow cooker, rice cooker and steamer. Like a slow cooker, recipes with a bit of liquid content will do best in the instant pot. The appliance requires a little liquid to build up pressure. Slow cooker recipes (like the ones you’ve already adapted! ), soups, meats, legumes, grains and root veggies all tend to turn out great. Skip steps in the preparation like flouring meat before you brown it: it may interfere with pressure building up properly. Instant pots hold a smaller amount than a typical stockpot or slow cooker, so you may need to adjust the proportions of ingredients when you’re adapting your recipe. Ingredients, especially grains and legumes, are going to expand as they cook. For optimal cooking results and your own safety, never overfill your instant pot. If you’re cooking a recipe that’s predominantly grains or legumes, the total volume of your ingredients should not exceed half of the capacity of the instant pot. 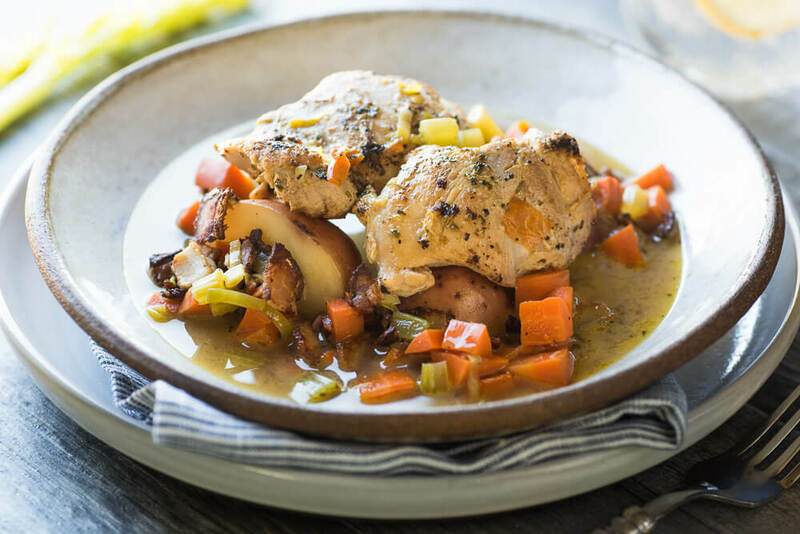 For all other foods (for instance, a whole chicken or a beef stew), ingredients including liquid should not exceed two-thirds the capacity of your instant pot TKeep in mind that this may change the number of servings your dish yields. Rather than using extra dishes, complete prep steps like browning meat or sautéing garlic and onions right in the instant pot on the sauté setting. Once they’re done, other ingredients can go right in on top before you begin pressure cooking. As a general rule, meat recipes will require about a third of time a standard oven recipe takes. Pasta and grains will take about half the time. If you’re converting a slow cooker recipe, consider starting with less than 10% of the slow cooker time (ie. under or around 24 minutes for something that would take 4 hours in the slow cooker). Meat tends to do well in the 25 to 30 minute range regardless of how long the slow cooker recommended time is. Because every ingredient is a little bit different, keepthis handy chart from Hip Pressure Cooking in your bookmarked websites. If your dish has multiple ingredients with different cook times, you may consider adding them in intervals; for instance, cook the large chunk of meat for two-thirds of its recommended cook time, then add quicker-cooking veggies towards the end. You can also adjust how recipes go into the pot, such as cutting meat into smaller pieces or leaving root vegetables in larger pieces, to create a more uniform cook time (and less math for you while it cooks). Like slow cooking, dairy should be added to your recipe at the end. A nice function of the instant pot is that you can remove the lid and continue to simmer without pressure once the pressure-cooking portion is done. This is a great time to add these more finicky ingredients and will round out the flavor of your dish beautifully. Wine and cooking alcohol may not break down as well as if they had hours to evaporate, so you might consider adding these in after browning meat or onions (but before adding the rest of your cooking liquid or ingredients), just to give the alcohol a bit of time to break down. If you’re using nothing but wine or beer as your cooking liquid, just use ½ cup to 1 cup less than the original recipe called for. When it’s the only liquid in there, it should steam off enough alcohol to cut the beery taste.